How do those glowing LED faucet aerators power themselves? 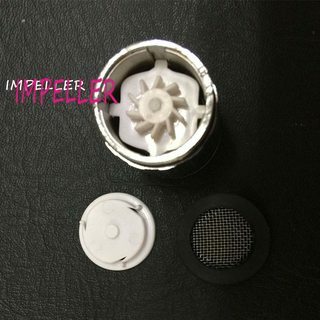 Do a web search for LED faucet aerator and you'll see dozens of different color-changing faucet aerators (and showers), most of which are powered just from the stream of water. How do they generate the necessary power? Is there a teenie turbine and generator? Some sort of oscillating fin on a piezoelectric bar? Gnomes? There is a small dynamo with impeller inside the faucet. When you turn on the faucet, the impeller will start to move by water flowing and make the dynamo work. The one I had was powered by either AAA's or stacked "coin" type cells. That, combined with the 2 inches of space lost in the sink made me ditch the whole system. I don't doubt that some are powered with a small turbine (or something like it), but some are just battery powered. Not the answer you're looking for? Browse other questions tagged electrical shower faucet led or ask your own question. What type of centralized home control hardware is available? Why are my LED lights glowing?